Tell me why the world is weird: "Homophobia" is an Ableist Term. Stop Using It. "Homophobia" is an Ableist Term. Stop Using It. 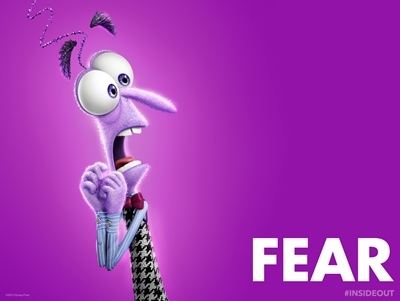 Fear, a character from the movie "Inside Out." Image source. Within feminist/social justice discussions about oppression and discrimination faced by various groups, you hear about a lot of "phobias." Most of the ones I've heard are related to LGBT identities- homophobia, biphobia, transphobia- but I've also heard of Islamophobia, fatphobia, etc. For pretty much any demographic, you can slap the suffix "phobia" on, and there's your term to describe opposition to the rights of those in that demographic. This is not okay. This is ableist. How do I know? Because I have phobias (which I have written about here and here) and I do not appreciate having my very real mental health issues being compared to hate and discrimination. Let's back up for a second: What is ableism? Ableism is discrimination against people who have disabilities- or, in this case, mental health problems. It's prejudice against people who have limitations such that they can't do things that able-bodied people can do. The use of terms like "homophobia" is ableist because it uses the negative stigma attached to having a phobia as a weapon against those who would like to deny rights to gay people. Rather than, you know, fighting against that anti-phobia stigma existing in the first place. So, about phobias. Wikipedia defines "phobia" as "a type of anxiety disorder, usually defined as a persistent fear of an object or situation in which the sufferer commits to great lengths in avoiding, typically disproportional to the actual danger posed, often being recognized as irrational." The key words here are "disproportional" and "irrational," and that's why people who suffer from phobias are so misunderstood in society. You see someone freak out over something that's (to you) totally harmless, and it's hard to empathize with them. You can't imagine why they're so scared and why they can't just "get over it." I saw a talk show once, where the host was interviewing a woman who had a phobia, and then the host actually brought out the object of her phobia, and she got up and ran, and the audience laughed. This is the way that our culture sees phobias. People don't understand how serious it is. They don't understand how the fear is so very real. They think it's funny to show you the stimulus and see your reaction. So if you clicked on the links I posted above, where I talked about my own experiences having phobias, because you were curious about what kind of silly thing I could possibly be afraid of, well tough luck. I'm not telling. I don't write this so that people can laugh. I write because I want you to know what it's like. People need to be more educated about mental health. Mental health problems are legitimate health problems, not something we should just "get over." Currently, my phobias are not a huge deal in my life. I very rarely encounter the things I'm afraid of, so usually I just don't think about them and I'm fine. Sometimes, though, I go through phases when I worry about the scary things a lot, and I regularly look around to verify that there are none near me. Maybe I even feel like I don't want to go to certain places because what if I encounter the scary thing? But I know I have to keep going places and doing things and living a normal life- I can't let the phobia win. And then, if I actually do encounter the stimulus, sometimes if it's not that intense, I can take deep breaths and be okay. But more often, I get really tense- my body is stiff, my heart races, I can't concentrate on anything else except imagining all the horrible ways this thing could hurt me. I can't enjoy myself, I just have to get out of there as soon as I can. If you think this is in any way similar to dehumanizing entire groups of people, saying and believing offensive things about them, and fighting against their rights, I don't know what to tell you. Ah, but wait. Somebody's going to say, "But homophobes actually are afraid!" Okay, yeah, I agree with that. A significant amount of "homophobia" is rooted in fear. Maybe people are afraid of how society will change if we treat gay people are human beings deserving of full equality. Maybe people are afraid that granting rights to others will cause them to lose some of their own power. Maybe people are afraid that God will send them to hell if they don't take a stand against LGB rights. So yes, I totally buy that argument. "Homophobia" can be thought of as a fear of gay people/ gay rights/ gay equality. Okay, so it's a fear. A phobia is a very specific type of fear. It happens when the mind takes negative emotions, past trauma, abstract fears, etc, and irrationally attaches them to a very specific object or situation. Then, when the person comes into contact with that object or situation, all of that negativity and distress comes out. For example, one of my phobias is very much associated with the feeling that other people don't care about me. And unfortunately, this is self-reinforcing: if someone has the object I'm afraid of, and they are happy about it, it comes across like they don't care about me, like they're getting pleasure from hurting me. It's really not about that object at all. The actual object is totally not dangerous. But for me, it's a symbol of my belief that other people don't care about me. In other words, a phobia manifests itself as an irrational fear of a specific object, but if you dig deeper you find there are reasons behind it. "Homophobia" and other such "phobias" are the exact opposite: they present as well-thought-out arguments about why we should not extend these rights to this specific group, but if you dig deeper, you find the fear behind them. "Homophobia" is not a phobia. So, you're at a restaurant with your friends. Just relaxing. Everything is normal. Then two guys walk in. Oh my goodness, I think they were holding hands. Were they? They're not anymore... Oh my goodness, were they? WERE THEY??!!! Wait, wait, don't panic, calm down, breathe. They probably weren't. Don't make a big deal out of this. Yeah, they don't look gay, right? Everything is okay. Try to think about something else. OH MY GOD look at how he just leaned closer to the other guy, oh my goodness are they about to kiss? OH I HAVE TO GET OUT OF HERE! WHERE IS THE DOOR? No, no no no don't freak out like last time. And all this time, you're not even aware of the fact that you're very obviously staring, with the most incredibly worried look on your face. Your friend says, "Hey... are you okay?" and you say "yeah, I'm fine." Then someone happens to brush against you as they walk by, and you just about jump out of your skin. And you say, "no I'm fine I'm fine." And you continue to sit there, trying to ignore the fear and enjoy yourself, but you're still watching the two guys, and every move they make, you imagine it's the first step in initiating a kiss. Even though, why would people randomly kiss when they're at a restaurant? Nobody does that. But that doesn't matter- it's an irrational fear. And if they did kiss, oh my goodness, that would be the worst thing in the world. Why would it be the worst thing in the world? To you, it's obvious, but it's impossible to explain to other people. And you become more and more nervous, more and more jumpy, until finally you've built this thing up so big in your imagination that your mind seizes upon one particular motion that one of the guys makes, you decide this is it, this is definitely gonna be a kiss, and you grab your phone and fake like you just got a call, and say "sorry" to your friends as you rush outside. And then you sit there alone, so incredibly relieved to be out of that situation, but at the same time, you want to cry because the phobia destroyed what was supposed to be a fun, relaxing evening. I really doubt that anyone actually has homophobia, but I just want to say, if you did have it, you would probably know it was an irrational fear and you wouldn't try to actually stop gay people from having rights. See, when the stimulus is present, sometimes the fight-or-flight response can be so overwhelming it's literally out of your control, but when you're not experiencing the stimulus, you probably recognize it's not really logical to be so afraid of it. Okay now someone is going to say, "But you're not gay [or bi or trans or whatever word you want to tack "phobia" onto], you can't tell us what words we're allowed to use to describe the oppression we face!" All right, so if you make that argument, you're saying that gay people [or whichever group we're talking about] are more oppressed than people with phobias, so people with phobias don't have the right to tell gay people what to do. So... you want to play oppression olympics? As if we have to figure out which issue is a bigger injustice, and we're only allowed to care about that one? I mean, mental health issues and LGBT issues are so incredibly different. Both groups face oppression and aren't fully accepted by society, but how could you possibly compare them and decide which is worse? The prejudice and negative stereotypes manifest in completely different ways. It has to be possible to advocate for LGBT rights without throwing people with phobias under the bus. Okay, and now someone is going to say, "Umm hello, don't you realize that a word can have more than one meaning? So 'phobia' sometimes means a psychological condition, and sometimes it means prejudice." All right then, would you like it if I said "that's so gay" to describe something I disliked, and then claimed that "gay" has two different meanings, and using the word "gay" to express my negative view of something does not at all contribute to negative attitudes towards actual gay people? When people use the word "homophobia", it's obvious that the "phobia" there means something very very negative. It means the "homophobic" person is doing something that is NOT OKAY. It means they are making a choice- A CHOICE- to treat people badly. I have phobias, and that is not at all a reflection of my character or my ability to treat people as full human beings deserving of 100% acceptance and equality. And IT IS NOT A CHOICE. And I have a big problem with the term "phobia" used as shorthand for "being a bad person." If you want to tell me that "phobia" has two different meanings, and one does not affect the other at all, I will believe it when society stops laughing at phobias. Because all I hear is "people who don't support gay rights are as ridiculous as those silly people who are afraid of harmless stuff for no reason, haha." All right, so what word should we use instead? Unfortunately, I have to admit that the word "phobia" is very grammatically versatile- it can be a noun ("whateverphobia"), an adjective ("whateverphobic"), and even can be a noun that refer to a person ("whateverphobe"). My ideas for alternatives aren't quite as easy, but I think fighting against ableism is worth it. So, we can use "anti." Anti-gay, anti-bi, etc. "Anti" is pretty neutral though. If we want to call someone's character into question and emphasize how unreasonable they are, the way "phobia" does (ugh), we can use "hate" as a suffix. I think "you're a homophobe" and "you're a gay-hater" would be equally insulting to a gay-hater, and only one of them perpetuates negativity about phobias. So this is a good option. So, I'd like to conclude by saying if I'm literally the only person who cares about this, then I can't expect everyone to change their language just for me. We need to do further research and find out if other people who've experienced phobias are also bothered by this "phobiaphobic" language. And if a significant proportion of us are bothered by it? Then you have a responsibility to stop using those words, and stop participating in our oppression.